This post carries on my summary of Clear Village’s Walled Kitchen Garden Project running in partnership with Imogen Heap’s composition of #heapsong3. Saturday morning we cleared the field; Saturday afternoon we started the collaborative design process. Sunday morning brought the largest team to the site. The team hailed from many diverse locations. I travelled from Southern England, while others travelled from the other areas in England, United States, Slovakia, Bulgaria, Scotland, Northern Ireland, and Cyprus to join in the fun. Everyone worked around their own obligations with some people making a holiday of the workshop while others bounced around as they needed to. Martin greeted us on Sunday by mucking around on the guitar while other facilitators explained the project to the people joining in. With all the new faces, we hit “Rewind” on the design workshop, choosing to prototype an element of all of the designs. Creativity gets unleashed with an incubation period. After the feedback session from Saturday, we could identify the strengths of each design to see if it was feasible. Saturday morning found us trying to prototype a reciprocating roof made of bamboo, a repetitive tripod structure, a free-standing triangular structure (affectionately dubbed “The Cheesecake”), and a central pole people’s pavilion that could serve as the entrance. My group was working on the central pole design. I wanted the design to have some echoes of the local environment. Too many “new” structures stick out like a sore thumb because they lack continuance with other things around. On Saturday, we experimented with tripods made of fallen sycamore trees so we had two reasonably straight sycamore trunks with a fork. We brought one fork down from to the field for our prototyping. Continuance came from using the sycamore as the central part of the design. Our design called for putting the sycamore in the ground to anchor it. The trunk went straight up and down so I wanted it stable. No trees crashing down on my head, please. Incidentally, the first thing we wound up prototyping was digging the hole. Our field was mostly a heavy clay soil. It had compacted considerably. Digging the holes proved rather fitfully difficult. We started working with the spades, but the soil was hard, the spades didn’t move the soil easily, and it was easier for us to go out rather than down. Then someone brought us the hole borer. The hole borer was sized almost ideally to our task. But the soil proved incredibly resilient. We would get the borer down 2 to 5 inches, it would get stuck, we’d pull it out, and then clean out the loose soil with hand spades or by hand. If nothing else, my team had the technical knowledge of working in the space. When we got the central pole in, we placed the four bamboo rods that would be supporting the netting overhead. Our design called for four more holes to be dug to support bamboo poles that would give height to our pyramid (enabling people to walk around the structure). Since we purchased pre-cut bamboo, the bamboo itself served as a natural measuring stick. One 4-metre length of bamboo determined the side. We also had to figure out how to support the various angles coming together with lashing. And other prototypes started to fill the field…. We learn so much about design when we actually try to build and install them. The “Cheesecake” team found some stability issues when they wanted to keep their structure free standing. The “Reciprocating Roof” team found that there’s actually a lot of knowledge required to make a roof self-support so they wound up pulling the plug on that feature. The “Tripod” team realised that they could get adequate support on two legs. And my “Centre Pole” team learned that digging holes is fitfully difficult. 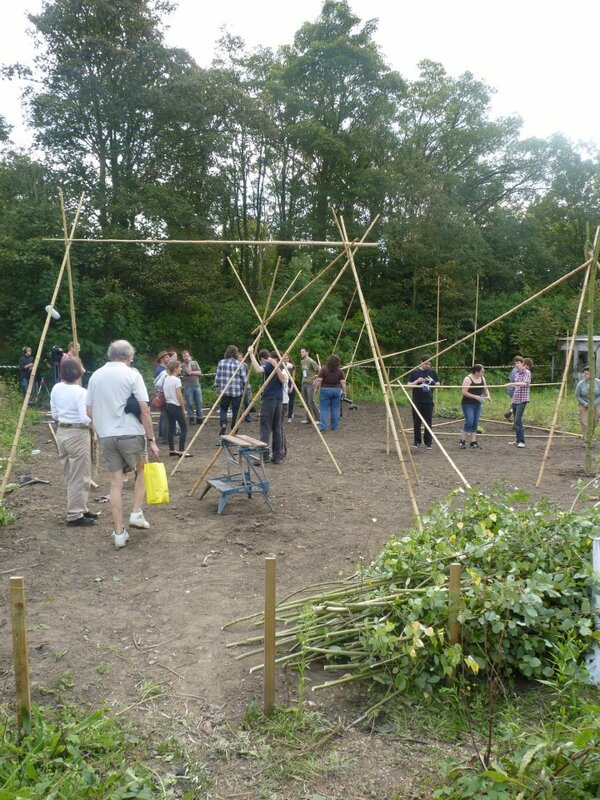 When the gardeners could walk around the structures, they had a distinct preference for the openness of our centre pole structure. And as the stones were cast, the centre pole formed the base concept. Tune into the blog tomorrow for our recording session with Imogen Heap. This entry was posted on 1 October 2011 by practicinghuman. It was filed under Walled Garden and was tagged with engineering, fun times, Imogen Heap, life in England, living with technology, wacky possibilities.